Ask middle school students if they’re going to college, and more than 90% will respond yes! They are definitely going to college. (Harris Interactive Poll) Their parents are on the same page, with nearly the same percentage stating that a college education is very important for their child. In spite of these high aspirations, in Washington state, only about 55% of high school graduates go on to college – and that rate has been relatively constant for nearly 10 years (The BERC Group). So what happens between the high hopes of middle school students and the reality of Washington’s stubbornly low college enrollment rate, which is one of the lowest in the nation? Obviously, there are many stumbling blocks on the path to college and lots of reasons so many families’ college dreams are derailed. But one rather straight forward strategy is showing promise in addressing many of these barriers: the College Bound Scholarship Program. The College Bound Scholarship Program was launched by the Washington state legislature in 2007. Low-income middle school students can have their in-state college tuition covered if they maintain a C average or better, graduate from high school, and stay out of legal trouble. The catch: students MUST sign up by eighth-grade to be eligible. Seven years into the College Bound program, how are students faring? A recent evaluation of the program suggests that this simple promise is helping motivate low-income students to stay focused on college. In fact, 63% of students indicated the program motivated them to stay in school and graduate, and 83% said it motivated them to get better grades. As a result, low-income students who sign up for the scholarship are doing as well as more affluent students on some of the critical steps on the path to a college degree – even better in some cases: 56% of scholarship students graduated from high school having taken the courses required to get into a four-year college, compared to 61% of higher income students and 30% of other low-income students who didn’t sign up for the program. 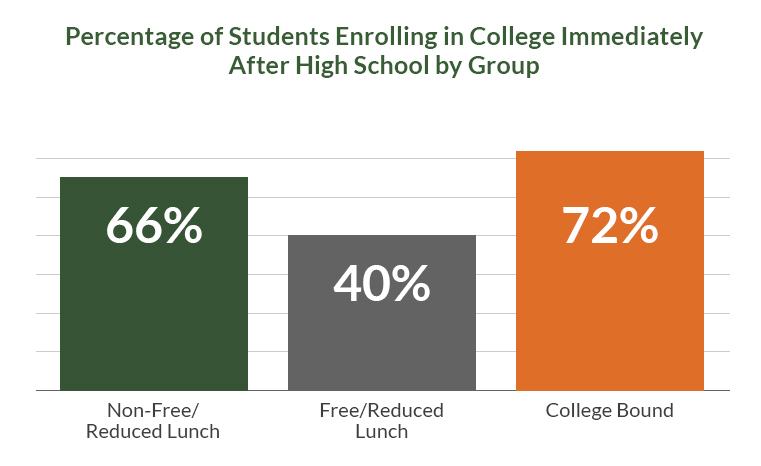 Even more significantly, the program appears to be working to close the college enrollment gap for low-income students: 72% of the low-income student who signed up for the program enrolled in college, compared to 66% of higher income students and 40% of low-income students who didn’t sign up for the program. Early findings on the College Bound Scholarship program suggest that when students and families know there will be a way to pay for college, students are more likely to stay engaged in school, take harder classes, and stay focused on college. All of which are critical steps toward making college aspirations a reality. Learn more by reading the research summary, full report, or recent media coverage of the program in the Seattle Times. Don’t forget to head to the College Bound website to see if your family qualifies for the scholarship. Students must sign up before June 30 of their eighth-grade year!